Face à l’Impressionnisme, Jean-Jacques Henner (1825-1905), le dernier des romantiques (Facing Impressionnism, Jean-Jacques Henner (1829-1905), the last of the Romantics) Paris, Musée de la vie romantique, from June 26, 2007 to January 13, 2008. It seems surprising at first to hold an exhibit for over six months of one hundred works by Jean-Jacques Henner when he already has a museum in his name in the French capital. In fact, this transfer is due to the closing for restoration of the Musée national Jean-Jacques Henner : mosaics, marble and other décors that were negligently altered in the XIXth C. should recover their original luster. Another reason that justifies holding this show is the sad but eloquent fact that there will probably be a hundred times more visitors here enjoying Henner’s work than would go to his museum, although it is located only a dozen blocks or so away. Of course the presentation designed by Rodolphe Rapetti and Daniel Marchesseau includes pieces from other institutions (Petit Palais, Musée d’Orsay, provincial museums) but two-thirds of the display comes from the hôtel Henner. As we know only too well the curiosity of Parisian art lovers has its limits and many marvelous sites remain undiscovered welcoming only a few thousand, in some cases only a few hundred, visitors a year. The impeccable management of the Musée de la vie romantique, both in its holdings (collections, décor, gardens) and its public relations (press, friends of the museum, sponsors, etc.) has turned it in a few years into a major establishment. So it is fitting that it have the honor of spotlighting Jean-Jacques Henner’s work for the first time in over a century. The show takes a new look at this artist who has been so caricatured and who is remembered mostly for the least interesting aspects of his painting, pictures of red-headed women repeatedly reproduced during the 1890’s, early 1900’s and even more so after the painter’s death for money-making purposes. There are as many fake Henner works today as there are real ones. The rigorous choice of one hundred or so works selected by the show’s commissioners has managed to correct these prejudices and clichés. The first room presents large formats as well as works produced by Henner as a young artist still under Italian influence such as in the fine self-portrait of 1847 or The Chaste Suzanne of 1864 (ill. 1). The landscapes, close to those of Corot’s, reveal both a sensitive and classical painter. In the small room next door there are some beautiful still-lifes and the famous Alsacienne with its patriotic message that nonetheless avoids conventionalism to reveal a talented piece of work. On going down to the lower level, one can admire some of the master’s most beautiful canvases. Henner’s most famous portraits allow us to follow his progress. Those from 1874/1875 make up his academic period : the study of colors, browns, blacks, a preference for blue backgrounds evoke Holbein. 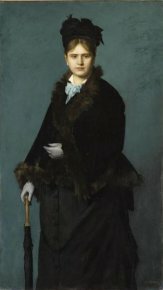 A Woman with Umbrella (ill. 2), a bourgeois symbol if ever there was one, shows that he was not beguiled by his commissions and did not trade in his critical eye to court favor. This splendid work is also a terrifying image of the emptiness of some of the parvenu circles : the bovine look and the lack of elegance in the posture make this blatantly stupid model a caricature of the newly rich shopkeeper. But what a painting ! The Portrait of Countess Kessler (ill. 3) ten years later, shows a freer manner, as well as a totally different content with the personality of the subject showing a clear impact on Henner’s style. Wife of a well-known patron of the arts, Countess Kessler had a strong personality. The painter has seized her strange gaze, accented her pale complexion, placed a ghostly halo around her dress and definitively found in her all the elements that will be dear to him from then on : ashen skin, red hair, violent contrasts of light. It is one of the most beautiful paintings in the exhibit. Later still, in 1892, the Portrait of Germaine Dewis, in all its aristocratic grace, recalls the androgynous profiles of Burne-Jones or some others by the young Khnopff : Symbolism is not too far away in this year of new idealist tendencies. 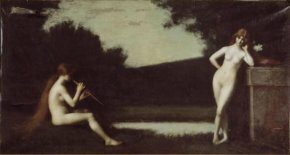 The exhibit ends with a visit of the workshop where one can admire the paintings that made Henner famous : Eclogue of 1879 (ill. 5), with figures that reveal pearly white skin and coifed with flaming red hairpieces residing in a landscape of muted colors, is the perfect achievement of a style that prefigures the visions of René Ménard. The extraordinary success of these paintings unfortunately lulled the painter into an effortless repetition of the formula that little by little rendered it meaningless. The works displayed here still retain their value and justify his popularity with a few exceptions, however, that denote his weakening style. Also hanging in this room is the Saint Sebastian, with its monumental composition and limited color range, acquired by the French state at the Salon of 1888. This painting as well as some others seems to have a bit too much varnish probably due to a recent restoration. Time will soon repair this minor flaw. Leaving the exhibit with its harmonious display on dark walls in a period setting, one grasps the qualities of a true painter while sensing at times a certain emptiness in his work. Although the choices presented are well made, they are not all the work of a genius. The oils are far superior to the drawings which remain disappointing. Overall, the exhibit is pleasant and there are several masterpieces worth seeing. Finally, a beautiful catalog, with clear texts and fine editing, contains essays explaining Jean-Jacques Henner’s role in the artistic world of the time, as well as notes on the paintings. One last word to regret, even if we do understand the reasons, the choice of title for the exhibit. It implies once again that XIXth C. art history revolves strictly around Impressionism : before, during, after, behind, facing, for, against, above, below... Art historians should also try to convince museum goers to attend exhibits where there are no Monets or Sisleys without resorting to the equivalent of Impressionist kamasutra ! 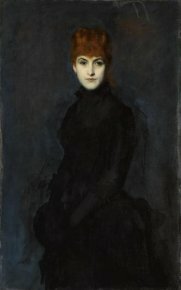 Face à l’impressionnisme, Jean-Jacques Henner, le dernier des romantiques, Catalogue coedition RMN / Paris Musées, contributions by Daniel Marchesseau, Rodolphe Rapetti, Isabelle de Lannoy, Claire Bessède, Isabelle Collet, Emile Vanhaesebroucke. 165 p., 35 €, ISBN 978-2-7596-0012-0.